The Eurasian Harm Reduction Association (EHRA) in the scope of the EECA Regional Platform project supported by the Global Fund is aimed to organize a workshop targeted on civil society and community representatives in Azerbaijan. The workshop is going to take place in Baku (Azerbaijan) on 7 – 8 of June 2018. The working languages of the workshop will be Russian and Azerbaijanian. The candidates are invited to submit their CV, Letter of interest and state the daily rate in USD (including the taxes) by e-mail referenced under title “Consultant to develop and facilitate S&T Workshop in Azerbaijan” to ivan@harmreductioneurasia.org by COB 03 of May 2018 24:00 EET. The Eurasian Harm Reduction Association (EHRA) announces the convocation of the members online General meeting, in period from 21st May 2018 to 4th June 2018. Eurasian Harm Reduction Association announces the convocation of the members regional meetings to elect Steering Committee members from the following regions: South-Eastern Europe and Russia. 5 June, 2018 – announcement of the results. We are inviting all EHRA members from the above-mentioned regions to submit applications to become a member of the Steering Committee until 14th May, 2018.
to avoid a potential conflict of interests, candidates cannot be representatives of Association’s donor organizations. ATTENTION! According EHRA Regulations, a country represented in a particular region may have only one representative in the Steering Committee who is elected in the Regional Meeting. Therefore, EHRA Members from BULGARIA CANNOT submit their candidacies, as one of the EHRA Steering Committee members is from Bulgaria. Author: Olga Belyaeva, Advocacy Manager, EHRA. «I was impressed by three unique events recently: seeing the Moon through a telescope, a concert by the rock band Leningrad and our training workshop. Alexander Kudryashev, Minsk. After our meeting was compared to the Moon and the creative and self-sufficient musician Shnur I feel entitled to publish my notes for people who organize meetings for people who use drugs*. So here’s the task: hold a training workshop based on IDUIT, which was created by the International Network of People Who Use Drugs with the support of UN agencies. It’s important that we understand and have a clear definition of the role we want to play in the decision-making process and in the implementation of those decisions. We also need to understand how we can progress from being manipulated by the system to being able to influence decisions, shape state policies and strategies regarding drug policy and programs for people who use psychoactive substances. UN agencies developed guidelines on the proven and scientifically-based interventions that can influence the risks of spreading HIV and Hepatitis C among people who use drugs. The International Network of People Using Drugs (INPUD) developed the IDUIT Practical Guidance that aims to preserve the values of harm reduction and allow community-based implementation of programs during the development, implementation and evaluation of necessary interventions. IDUIT describes how programs for people who use drugs can be carried out from the point of view of meaningful involvement of the communities in decision-making, program implementation and monitoring of their effectiveness. The document answers the following questions: what can we do and what should we do today, given the resources in hand and the circumstances we are in, to stop the spread of HIV and hepatitis C among people who use drugs? How can we, during the three days of the workshop, share the knowledge and experience of thousands of people who, in some countries, survive despite provocations, killings based on suspicion only and torture, and in others, live safe lives, take part in medical heroin programs and work in cannabis grow shops or drop-in centres? – a person from the community who believes it’s extremely important personally for him, for his family and friends to solve the systemic problem that results in repression against people who use drugs. Such a person attracts people with a purpose who are dedicated to changing the society’s attitude to substances and drug policies. There is a community of OST patients in Belarus called “Your Chance” and a movement of students who have the same goals as we do – decriminalization of all substances and humane drug policy. – conditions. In the countries of our region where the drug policy is repressive and the rights of people who use drugs are very difficult to reinstate, the venue for the meeting should be free from any monitoring or control systems. It shouldn’t be a hotel with security and video cameras that contribute to increased nervousness and risks. Negotiate with a local drop-in-centre; ask people where they feel safe and comfortable in the city. It will help maintain positive dynamics and energy for change within the group. Also, the money that you’ll pay for the venue and food will go to the harm reduction programs and not to some business’ pocket. – source of energy to keep moving. For all the living things on earth it’s the sun. For a community movement it’s its values. An IDUIT coach should have a clear vision of the goal he’s leading the group towards, a coach who doesn’t need words to make us see the future we’re heading for. One’s right to privacy and to deciding whether to use a substance should be protected. Why did doctors in Amsterdam offer an apology to a guy they delivered methadone to while he was out but didn’t wait for him in order to say hello? While in our countries nurses end up behind bars for opening OST sites. We drew up a layout of our drop-in centre which is cozy and has sustainable financing. It’s the first step towards understanding what we have at the moment and what can be changed. During the discussion, we ascertain and reiterate that it’s impossible to achieve safe and effective risk reduction programs without decriminalisation and science-based regulation of the psychoactive substance market. In Belarus, there is zero tolerance towards substances and people who use drugs. Any amount of substance, starting from 0.00..3 is already too much. “Too much” means 6 to 8 years in prison. The list of illicit substances is drawn up in a way that makes any new synthetic drug formula illegal. When synthetic drugs were legal, – say the participants, – they were used as stimulants: they made things and colours a bit brighter and the high from them made users feel better. Then access and formulas became more complicated. Now we are talking about adolescents of 12 to 14 years of age who consume cocktails the effects or risks of which are impossible to control. And we can’t even talk to them about the risks and ways to reduce them because the system will see it as propaganda of use, especially among minors. Only adults aged over 18 can enroll on harm reduction programs. We have to be careful all the time about what exactly we’re discussing due to the risk of being jailed for spreading such knowledge. What is “IDUIT”? It’s a description of approaches to and examples of creating a world in which people who use drugs are free to be themselves. That’s why we study each chapter of “IDUIT” through hands-on training where key values and foundations of the community-based approach are able to manifest themselves: motivational integrity, clear unambiguous goal, realities of the drug scene and ways to preserve the health and mental strength of people who are forced to be invisible for everyone, especially for the system, to survive. Chapter One of IDUIT: empowering the community. We focused on a real-life situation that OST clients in Belarus are faced with – issues with the right to receive medication for self-administration. At the time of the meeting on March 27-29, a new instruction on OST, which included mechanisms for dispensing the drugs, passed the first stage of agreement by experts and civil society. During stage two, when the law enforcement agencies and other executive authorities were to approve the draft instruction, the chapter on dispensing medication for self-administration was removed. Sergey Kryzhevich and Sergey Gartsev, leaders of the public organisation of OST patients “Your chance” had been responsible for preparing the documents on the part of the community. Together with the participants of the workshop they chose and invited experts to consult with regarding the next steps. This was the key moment for attracting allies and partners – when people are ready to hear about your motives and tasks, understand the goals and see what can be done right now to support the initiative. As a result, we prepared a letter to the Minister of Health requesting a suspension of the approval of the OST instruction and asking to reinstate the chapter on dispensing medication for self-administration. We collected 47 signatures and took them to the Ministry of Health of the Republic of Belarus. We wrote to the UN agencies and to the Global Fund. We organised meetings and telephone consultations with relevant agencies: UNODC and UNAIDS. With the help of the Chairperson of the Country Coordination Mechanism (CCM) – Deputy Health Minister – a working meeting has been arranged involving all those who developed the Instruction, as well as addiction doctors, representatives of UN agencies, OST patients and drug control representatives. The meeting will take place on April 11 and will aim at agreeing the full and final version of an Instruction that will observe the human right for affordable and quality medical care. We have a week to prepare for the meeting thoroughly. Our task before it is to establish the position of all participants and to hold consultations. During the meeting, we take notes and put the outcomes of the discussions in writing immediately after it wraps up. And, of course, we are working on a plan B. The question of dispensing drugs to take home is a fundamental one: people are tired of having to choose between family and addiction treatment, career and addiction treatment, travel and addiction treatment. This is about understanding what Chapter One of the Guidance means in practical terms: it’s about empowering the community through clarifying goals, motives and clear distribution of tasks within a team. It’s also about the meaningful participation of the community in decision-making. This is Chapter Two of the Guidance: legal reform, human rights, stigma and discrimination. It’s difficult to talk about the rights of people who use drugs in a country where a patient recovering from an overdose in hospital sees the police next to him and then he is taken from the hospital bed straight to court and to prison for three years. People fear that they might attract attention of drug control services if they’re caught looking up overdose treatment for bath salts on the internet. The war on drugs means eight years in prison which in turn means loss of health, money, illness and suffering in the family – things that are completely disproportionate to the effect and quantity of the drug they consumed and subsequently are being punished for. It was an inspiration to learn there is a movement of students in Belarus who united to achieve humane and reasonable drug policy. We discussed the practical side of decriminalization in Portugal and the Czech Republic. The leaders of OST patient communities had already visited these countries and were confident that we could achieve a similar level of respect for the rights of people who use drugs. We discussed areas where we can support each other especially in the circumstances where we must think about the safety of the experts who help people who use drugs. Chapter Three of the Guidance – health and support services from the point of view of the community. We discussed the lifestyle of a teenager who suffers from substance abuse. We heard about the work being done with relatives and friends of drug dependent teenagers in order to reduce risks. We prepared draft memos for people who use bath salts drawing on the practical experience of the participants such as people who consume stimulants and doctors. It’s the most pressing issue in Belarus: users of synthetic stimulants (new psychoactive substances) avoid any contact due to repressions, when going online to look up tips on sleep after taking bath salts could attract troublesome attention from authorities. We’ve come up with a plan to spread information. After watching the film “Bevel Up: Drugs, Users & Outreach Nursing”, shot about ten years ago and showing work of Canadian street nurses, the participants realized how far other countries have progressed towards humane and not discriminating attitude towards drug users compared to our countries. In order to get closer to people who make or influence decisions, a meeting was organised with the representative of the Global Fund Grant Management Group in Belarus. We invited our colleagues from other groups vulnerable to rights violations to this meeting to form partnerships and communicate with community networks. Anya Nazarova, the leader of an initiative to help HIV-positive women (Belarus), attended it. By the time this blog is published, Anya should already become the head of a registered organization. Chapter Four of IDUIT described community-led harm reduction service delivery approaches. The Global Fund grant for 2019-2021 is set to continue unchanged, but there is an opportunity for pilot projects. Building on their priorities, the workshop participants decided to prepare an application to the Community, Rights and Gender (CRG) Technical Assistance Program to justify the adjustments that should be made to some of the harm reduction programs so that they meet the needs of people who use synthetic substances. We also discussed the creation and funding of community-based and community-led drop-in centres. The money for our services is trapped within the system of repression and war on drugs. We need resources to prepare the rationale and proposals for change. We decided that the application for technical assistance under the Community, Rights and Gender program will help with the rationale. When we arrived at Chapter Five – Program Management, hiring people who use drugs – employment-related questions arose. The meeting participants told us that harm reduction organizations require employees to give a written statement saying that they are aware that it’s forbidden to work while under the influence of drugs or alcohol. The case of Sergey Kryzhevich shows that even the Supreme Court can’t issue a just ruling – he was unable to get his driver’s license back or cancel the fine of 1000 euros even though the evidence suggesting that he had been intoxicated was obtained with violations of some key procedures. In the Republic of Belarus, it’s illegal to be in the workplace in the above-mentioned state. And we, the workshop participants and the employee of the Global Fund grants management team, were asking ourselves why harm reduction programs require their staff to sign such statements when they hire them for the very reason they use substances and therefore are able to help others reduce risks; what can those statements protect the employer from, and what risk do the outreach workers take when they sign them? The issue of the labour rights of people who use drugs has been up for an open discussion. This is the basic principle of the IDUIT Guidelines: to recognize human rights and freedoms, and if that’s not achievable today, to help by all means to achieve the ultimate goal: to exercise the human right to privacy, to respectful, affordable and safe social and medical assistance based on real needs of people who use drugs. The training workshop was organized on the initiative of the UNODC Regional Office for Eastern Europe, prepared and conducted by the Belorussian public organisation “Your Chance” and the Eurasian Harm Reduction Association. http://www.who.int/hiv/pub/idu/targets_universal_access/en/, the 2012 version. Geneva, WHO, 2013. Consolidated guidelines on HIV prevention, diagnosis, treatment and care for key populations–2016 update. Geneva, WHO, 2016. 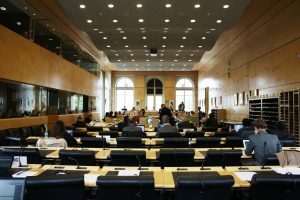 The Eurasian Harm Reduction Association (EHRA) and the Canadian HIV/AIDS Legal Network, together with communities of people who use drugs from Estonia and Kazakhstan are presenting two parallel reports to the 62nd Pre-Sessional Working Group of the UN Committee on Economic, Social and Cultural Rights (CESCR), which is meeting in Geneva this week. Today, representatives from EHRA and Estonian organisation of people who use psychoactive substances LUNEST will give their statements regarding the enjoyment of social rights among women who use drugs and/or living with HIV in Estonia. On 4 April, during the discussion of the report from the Government of Kazakhstan, the issue of access to opioid maintenance therapy (OMT) and the protection of human rights of drug-dependent individuals and people living with HIV in the country will be raised. Both parallel reports were written based on the disturbing information on the situation with people who use drugs that demonstrates that human rights of these groups of society in Estonia and Kazakhstan are gravely violated. In case of Estonia, its Government is requested to address the issues of health, parental, child protection, and labor rights violations incurred by women who use drugs. These violations were detected during a research study conducted by a team of non-governmental organisations in 2017. Despite the fact that Estonia, compared to other post-Soviet states, has made good progress providing access to HIV prevention and treatment, violations of human rights against people who use drugs, their discrimination and stigmatisation is still an everyday occurrence, especially on behalf of state institutions, such as the police, child protection, and public health services. The Government of Kazakhstan will be urged to provide information regarding the future of OMT programs, since the outcomes of the state’s assessment in 2017 may lead to the complete halt of these programs in the country. This is not the first time that CESCR is dealing with the issue of OMT in Kazakhstan: in 2010, the Committee called on the Government of Kazakhstan to ensure that methadone as substitute drug dependence therapy was made accessible to all drug dependents. However, by the end of 2017, OMT was available to only 2.69% of all injecting drug users on the outpatient register, contrary to World Health Organisation’s recommendations of at least 20% coverage. According to Dasha Matyushina-Ocheret, Policy Reform Advisor at EHRA, parallel reports and testimonials at the 62nd Pre-Sessional Working Group of the CESCR should help raise the issues of human rights violations in Estonia and Kazakhstan on the international level so that lives of people who use drugs are improved. “It is especially important that members of the Working Group, as well as Government representatives from Estonia and Kazakhstan, will hear first-hand accounts from community representatives on how their rights are violated,” says Ms. Matyushina-Ocheret.